In the quest to make features more user friendly, we have now added an option to edit shared expenses by entering the amount as highlighted in the screenshot below. 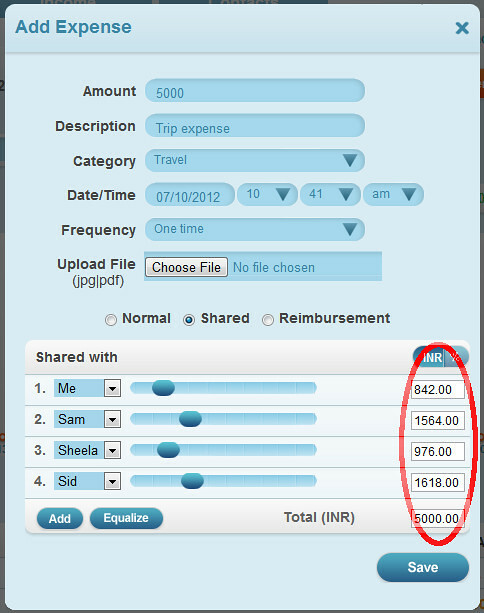 You can use a combination of both the slider and the textbox to define an expense. For instance, if you know the exact amount that each individual needs to pay, you can now just enter it in the text box highlighted above or move the slider to the appropriate figure. A big thank you to all the users for the wonderful feedback on a continuous basis. It is helping us shape Track Every Coin better for you! It would be very helpful to us, if you can add an option of partial payments made by multiple people for a given bill. This would make it simple for us when we want to add an expense ( which is shared by multiple people) and the payment of that is also made in parts by different people. In the current system we have to add a new bill for each payment made and also make painful calculations for sharing the same. Thanks for your feedback. This is a valuable feedback. We have noted this down and will implement the same going forward. Can you provide a way to maintain personal and company expenses in the same account? I run a business and I would like to visualize those transactions in TEC. I know I can create a new account but its nice to have it all in the same place – like multiple Google Calendars. You could do this by right categories for your company and personal expenses. At any time if you search by the corresponding category, you will see the total for that category.